With rains continue occurring in various parts of the state, arising flood situation, authorities in Kerala have declared a holiday for all government offices. Authorities have confirmed that at least 26 people have been killed. All shutters of the Idukki dam were opened on Friday after 40 years. As monsoon rains continue in the state, the situation is becoming worse as the water level in rivers, reservoirs in Kerala continue to rise. Ahead of the inauguration of the Idukki reservoir, a third warning was issued earlier in the day to maintain the water level. On Thursday, one of the gates of the dam will be inaugurated. 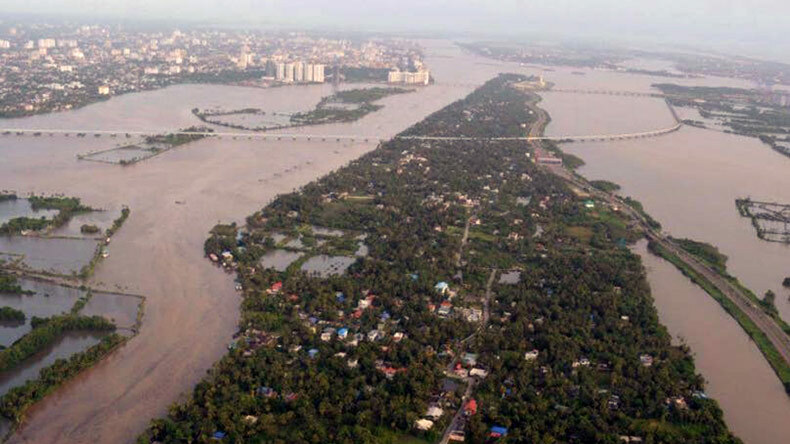 Also, for the first time in 40 years, all five shutters of the dams were opened that led to the rise in the water level of the Periyar river which in turn flooded Kochi’s Aluva. In order to monitor the situation in Kerala, naval teams, Sea King Helicopter and other security teams have already been dispatched to affected areas to evacuate people. 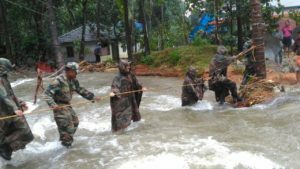 Meanwhile, in order to deal with the situation, around 200 Army personnel have been deployed in place including Ayannkulu, Idukki and Wayanad while another 150 were directed towards Kozhikode and Mallapuram. 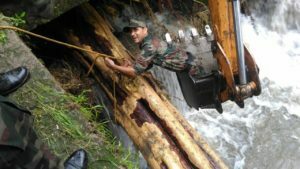 Moreover, in order to help stranded people, search and rescue operations have been launched in low-lying areas of Ernakulam and Idukki districts. So far, around 22 people have lost their lives in amid heavy rainfalls in Kerala. According to the MeT department, forecast about heavy rainfall has been predicted in several districts of Kerala in the next 24 hours. PM Modi assurance to Kerala Chief Minister Pinarayi Vijayan has come after earlier in the day he asked Centre for Army, Navy, Coast Guard and National Disaster Response Force (NDRF) assistance mentioning that the situation is very serious in the state. 07:32 pm | Visuals of Manappuram Sree Mahadev Temple which has almost submerged in the flood. In a bid to conduct a survey of the region, an Indian Coast helicopter and fire and rescue department have been deployed in the region. 05:59 pm | Home Minister Rajnath Singh is expected to visit Kerala on August 12. Reports said that he will conduct a survey of the affected areas. 04:30 pm | With incessant rains across Kerala, many areas are completely waterlogged. The severity of the situation can be jugded by looking at this video. 3:30 pm | “All 5 shutters of Cheruthoni dam have been opened in the wake of heavy rainfall. Idukki, Ernakulam and Thrissur districts have been alerted. People are being evacuated from the areas near Periyar,” according to CMO Kerala. 3:00 pm | Kerala Chief Minister Pinarayi Vijayan talks to Home Minister Rajnath Singh and discussed the current situation in Kerala. 2:50 pm | Operations at Kochi Aiport continue, earlier, floods cause airports authorities to close the arrivals. 2:30 pm | To deal with the flood-like situation, Army personnel have been deployed in the low-lying areas. 12: 15 pm | Considering the situation, CM Pinarayi Vijayan has instructed to alert the people living in downstream areas with the help of announcements. He has also instructed to relocate people living in vulnerable areas. 12:00 pm | Two more shutters of the Idukki dam were opened today morning, increasing the water flow into the Periyar river to 125 cuses (1,25,000 litres/sec). 11:45 am | As a precautionary measure, a holiday declared for all government offices. 11: 30 am | According to authorities, death toll rises to 26.